The New York Public Library just pointed fans to an online album of thousands of beautiful, free archival images published as part of the library’s NewNYPL initiative, to help it stay up with the digital times. A few Boston-related images have snuck into the collection. 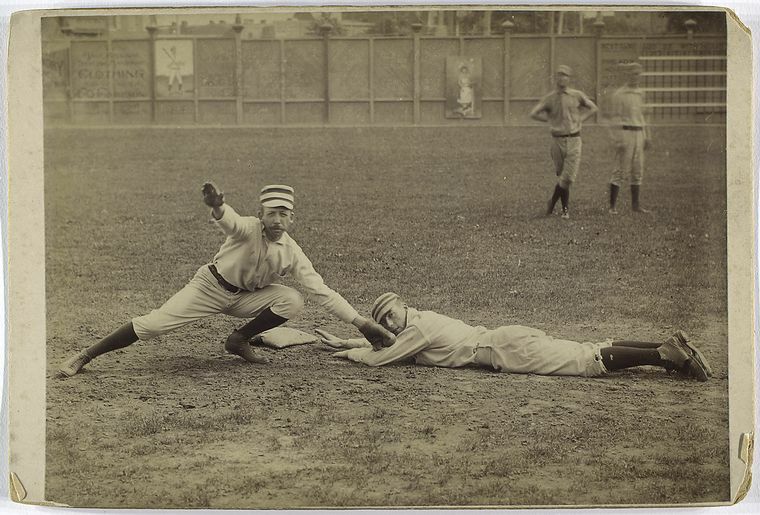 Among them, this image of Philadelphia infielder Arthur Irwin tagging Tommy McCarthy of the Boston Reds as he slides into base. McCarthy joined the Boston Reds in 1884, finishing with a dismal .212 batting average, but went on to play for the Boston Beaneaters and Brooklyn Bridegrooms (so-named because several of its players had just gotten married). There’s just no beating the names back then. McCarthy’s performance improved over his career, and he was finally inducted into baseball’s Hall of Fame in 1946, but baseball statistician Bill James has called him the worst player to be admitted. This entry was posted in Images and tagged Arthur Irwin, Baseball, Boston Reds, Hall of Fame, Tommy McCarthy. Bookmark the permalink.